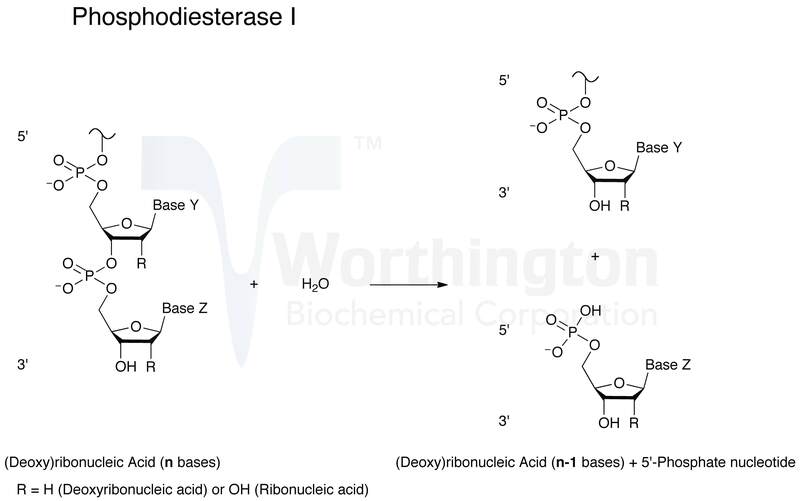 Venom exonuclease (Phosphodiesterase I) successively hydrolyzes 5'-mononucleotides from 3'-hydroxy-terminated ribo- and deoxyribo-oligonucleotides. It has been reviewed by Laskowski, Sr. (1971). The enzyme has been widely utilized as a tool for structural and sequence studies of nucleic acids (Ho and Gilham 1973). Molecular weight: 115,000 (Philipps 1975). Composition: A glycoprotein which binds concanavalin A. (Sulkowski and Laskowski 1961). Optimum pH: 9.8-10.4 (Philipps 1975). Inhibitors: Reducing agents such as glutathione, cysteine and ascorbic acid (Razell 1963). It is completely inhibited by 5 mM EDTA while ATP, ADP and AMP are partial inhibitors. Activators: The enzyme has an absolute requirement for Mg2+; Philipps (1975) indicates an optimum concentration of 15 mM. Specificity: The enzyme has been purified by Dolapchiev et al. (1974) and Sulkowski and Laskowski, Sr. (1961) with endonuclease activity being eliminated as well as 5'-nucleotidase and nonspecific monophosphatase. It is nonspecific with respect to base or sugar moieties of nucleotides. A variety of synthetic substrates are hydrolyzed. See review by Razell (1963). Ogilvie and Hruska (1976) indicate that exonuclease will not recognize nucleoside units in the syn conformation. See also Philipps and Chiemprasert (1975). ADP-ribosylated proteins are cleaved at the pyrophosphate linkages by venom phosphodiesterase to yield phosphoribosyl-AMP (Hayaishi 1976).